Kerala: July 13, 2018. Delhi: July 20, 2018. “Coach Ashraf was the first person to ever pass the ball to me,” Sophie tells Joshua, on a gray day up in the mountains of southern India. She is a rebel who has been paying a price for her self-respect, and is grabbing a moment of solace here with an old friend. Joshua is young like her, but his shoulders are slightly hunched under the crushing burden patriarchy places on men. “Actually, I was the one who passed the ball to you,” he corrects her shyly, before acknowledging that the coach had asked him to do so. A lesser filmmaker may have framed this brief dialogue such that it cries from rooftops, “See this, viewers! See how socially conscious I am!” Producer-director-writer Anjali Menon though leaves us to make of it what we wish. Read it, if you will, as an exchange of inanities between two people hesitantly picking up the frayed threads of a precious relationship snuffed out in its infancy. Or read in it thoughts left unspoken – by a woman remembering a mentor who backed her when she took the reins of life in her hands as a child, and by a man who may still not grasp the magnitude of that moment but is glad he was in it anyway. Jenny is what conformists might call “comic relief” in an otherwise intentionally languorous narrative. But to speak in terms of formulae would be a disservice to this lyrical film. Koode is a remake of Sachin Kundalkar’s Marathi venture Happy Journey in which a sister who has barely met her brother while she was alive appears to him after her death. 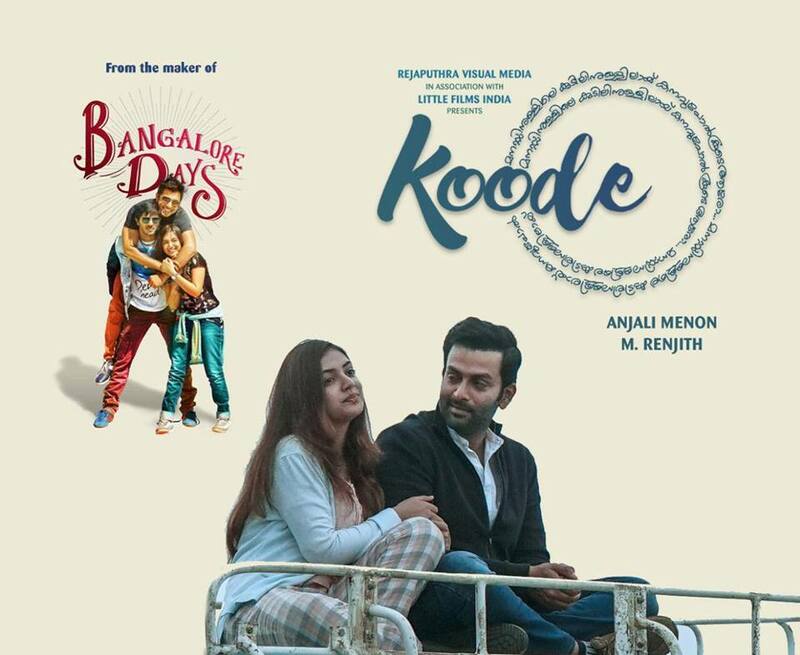 Kundalkar is credited with the story and Menon with the screenplay and dialogues of Koode. In the Malayalam retelling, Joshua is the older sibling who was sent off to work in the Gulf at 15 since he was floundering at school and the family desperately needed cash to treat baby Jenny’s congenital, life-threatening condition. The film opens with an adult Joshua (Prithviraj Sukumaran) returning home on receiving news of Jenny’s death. From the moment we first meet him, his entire being seems enveloped in a halo of sadness. It soon becomes clear that Joshua has long resented his family for destroying his youth. He is now resigned to a future of loneliness but Jenny (Nazriya Nazim Fahadh) comes back and will have none of that. Joshua is the only one who can see her, and she tries to help him see beyond his fatalism and bitterness. Whenever she is on screen, she lifts his spirits and Koode’s melancholic air. Parvathy Thiruvothu plays the schoolteacher Sophie, who was kind to Joshua when they were classmates and on whom he had a teenaged crush. In a bow to Happy Journey, the coach they love is played by Atul Kulkarni who was the lead in the Marathi original. “Koode” means “with” or “in the company of”. It is a word not usually seen on its own. By picking it as the name of her film, Menon therefore seems to be reminding us that solitude is one of life’s many acceptable possibilities and that relationships are worth having not to fulfill social obligations but when they enrich us. The title is perhaps rooted in Gandhi’s favourite hymn Abide With Me, a Christian funeral anthem of sorts, a Malayalam version of which, Koode parkaan, can be heard playing after Jenny’s passing. So much is said without being said, about fleeting acts of consideration that can alter lives, about how a patriarchy that overtly stifles women also covertly smothers many men, about the consequent silence around male child sexual abuse and the social opprobrium a divorcee in a small town faces, about how financial independence gives women the courage to opt out of suffocating relationships, and about the very human fear that we are or will be forgotten when we are not physically around our loved ones. Menon does it all in a film that is almost dreamy in its tone, with bursts of energy and sunshine provided by Jenny and sections of the soundtrack. Raghu Dixit’s background score and the songs – by Dixit and by M. Jayachandran – move smoothly from languid to lively, depending on the mood of the narrative. Having listened to the music in a loop since watching Koode, I am not yet sure of its standalone appeal for me independent of the film, but within the landscape of Joshua, Jenny and Sophie’s story, it is a great fit. The atmospherics of Koode would have been impossible without its spectacular camerawork. Kerala and Tamil Nadu, where it was reportedly shot, are nature’s gift to every gifted cinematographer, but DoP Littil Swayamp serves us beauty even in grubby pictures. From that breath-stopping opening shot of a group of men at an oil refinery to dreary desert sands to a wealth of greenery to the actors’ speaking faces, everything is an opportunity in his hands. He makes particularly good use of repeated aerial shots that, apart from visual magnificence, provide some perspective on the lead trio’s place in the larger scheme of things, which further serves to underline a point Jenny makes about focusing on the here and now since the past is gone and we know not what comes next. 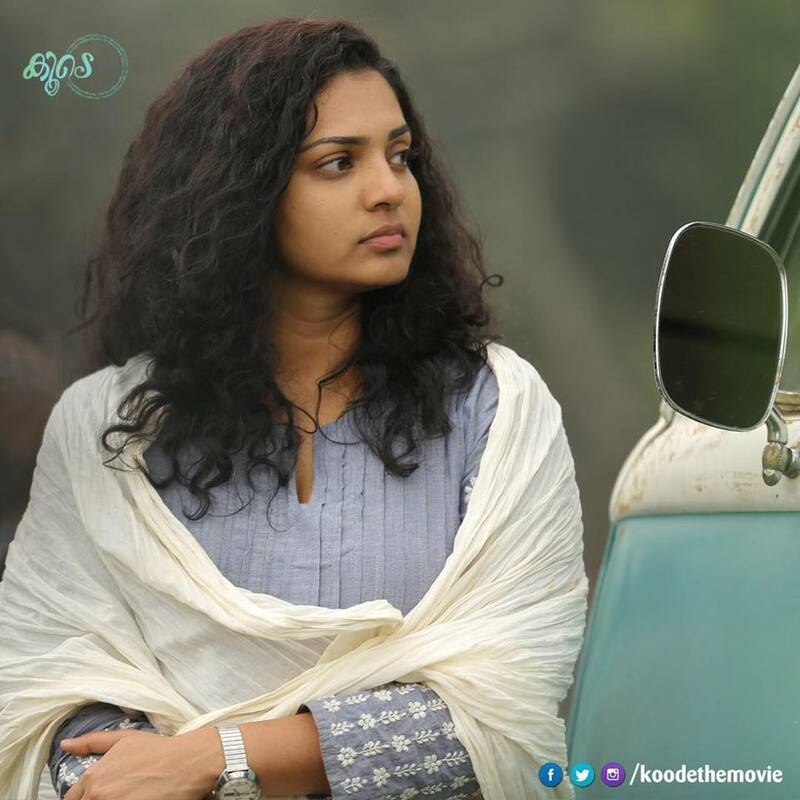 Parvathy has the most challenging role in Koode since she has the least dialogues and the least screen time of the three leads. I felt vaguely dissatisfied with the limited space given to this interesting individual, but the actor makes it work, imbuing Sophie with both a sense of intense dejection and a fire that marks her out as a contrast to Joshua: he is mostly battling inner demons, hers are external. The writing and Nazriya’s acting often cutesify Jenny, but it is possible to explain this away as the fallout of her being a sickly, much younger, possibly pampered child around whom her whole family’s existence revolved as long as she was around. Though this sort of hyper-bubbly girl is too familiar a sight in commercial Indian cinema, Nazriya’s charm is hard to resist. Besides, Jenny provides a necessary foil to the despondent Joshua. The fulcrum of Koode of course is the scripting of Joshua and Prithviraj’s brilliance. He turns his eyes into bottomless pools of sorrow while playing this broken man, every line and angle of his physique embodies the pain Joshua carries inside him, and yet whenever he is with Jenny, the actor manages to lighten up and transition into an attractive young man who has not, after all, forgotten how to laugh. It is a pleasure to see this fine artiste so absorbed in a character, especially because Mollywood often taps his stardom in films undeserving of his immense talent. Of the top-notch supporting cast, Ranjith Balakrishnan stands out for his sympathetic performance as Joshua’s auto mechanic father. I did not quite get the cameo by Sajitha Madathil as a teacher whose initial harshness towards the unwell Jenny is not consistent with her later actions. On the other hand, Devan is cast well in one of the film’s nicest satellite parts, as Jenny’s father who is, to overturn a cliché, the man behind this gutsy woman. Anjali Menon is best known among serious cinephiles outside Kerala for her direction of the blockbuster Bangalore Days (2014). Critically acclaimed though it was, I confess I am not thoroughly sold on it. Sure I enjoyed it for the most part, but I found Dulquer Salmaan’s briefly stalkerish behaviour and the othering of Nivin Pauly’s girlfriend problematic, as was the faux youthful hipness of some elements in the film. I fell in love with her work actually with Ustad Hotel (2012), which she wrote but did not direct. The trivialisation and othering of DQ’s European girlfriend was troubling there too, but it was a barely-there reference barring which the film was a gem. Koode’s vastly different storytelling style proves Menon’s versatility. It also tells us that she is a mistress of the unsaid. There are no banner headlines in this film so watch it carefully or you may just miss that hand sliding down a body where it ought not to be, a man in a conservative world reacting without judgment to a younger woman’s sexual curiosity and adventurousness, a girl in a position in which we tend to expect boys in music troupes, or the flash of a realisation that a woman at a steering wheel in a vehicle in which a man is also a passenger is a rare sight in an Indian production. I might have preferred it if the concluding scenes involving Joshua and Sophie’s stories had completely abjured social conventions or been left to the imagination, but that is a marginal quibble in a film that is, in its entirety, a near spiritual experience. Anjali Menon’s Koode is a sharply observant, occasionally humorous, emotionally stirring piece of cinema.